Sports – I say. Essay. Assay. ऐसे. In the early years that SONY Entertainment Television (SET) India (now Multi Screen Media) forayed into cricket broadcasting, among the first few series they acquired the rights for was from the Board of Cricket Control in Sri Lanka (now called Sri Lanka Cricket). When the Indian cricket team toured Sri Lanka in July-August 2001 the matches were broadcast on MAX, the newly launched movies & cricket channel of SET India. Apart from being a significant ‘first’ for the channel (which later broadcast many of ICC’s flagship tournaments, and the IPL), that Sri Lanka series also heralded another significant ‘first’: The debut of Navjyot Singh Sidhu – as a cricket commentator! A couple of matches into the series, and Sidhu had made his mark with telling effect! If ifs and buts were pots and pans, there would be no tinkers. The Sri Lankan score is running like an Indian taxi meter. 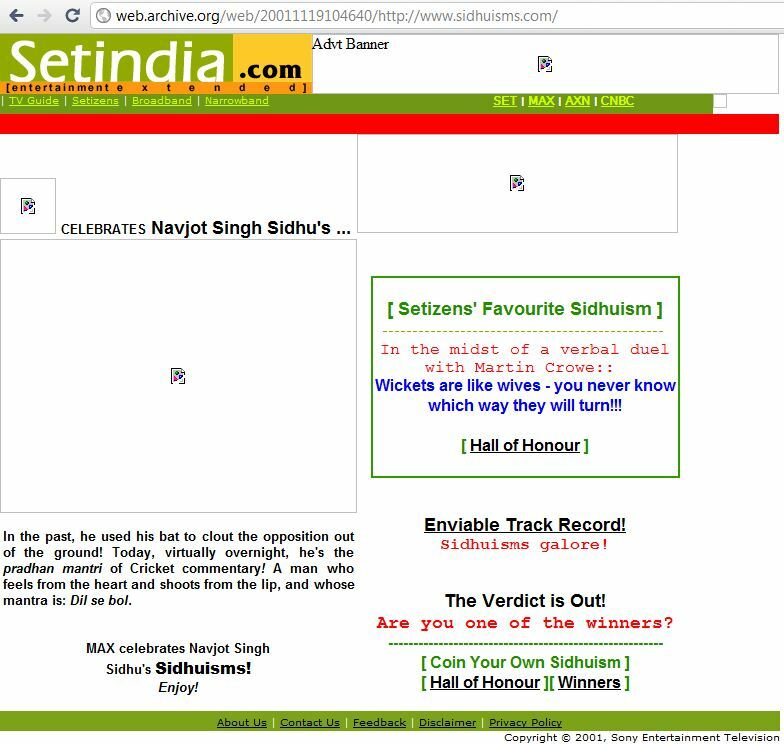 A few of us within the channel (most notably my colleague Pavan Chawla) realized there was more we could do and overnight we set up http://www.sidhuisms.com (sadly, no longer in use). The realization that Sidhuisms would acquire a life of their own had started dawning on everyone. 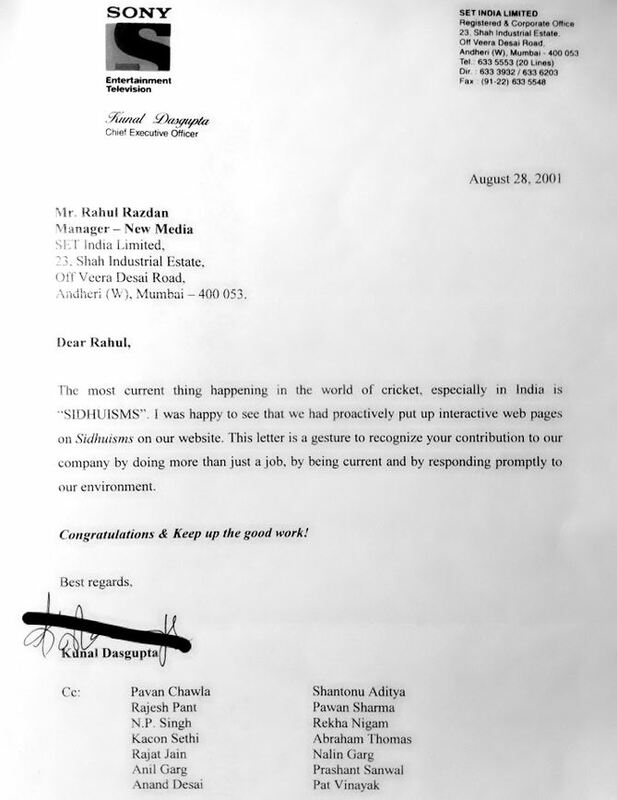 I even received a commendation letter from the then CEO Kunal Das Gupta. While the world at large was reacting with incredulity to Sidhu’s facility with words and his sense of dramatic enunciation, I recalled a hitherto unconnected comment from Ravi Shastri some years ago, where he’d shared that Sherry (the nickname Sidhu was called by) was the most entertaining cricketer in the dressing room. Contrary to his current critics’ labeling of him as a cliche-spewing commentator – Shastri during his active cricket days, was considered one of the shrewder tacticians in the game. Exemplified by the fact that in spite of possessing moderate talents with the bat, the ball, and in the field, he went on to become the original ‘Champion of Champions’ in ODI cricket, and for long shared the record for hitting 6 sixes in an over with the great Sir Garfield Sobers. He had also been slated to become the India captain. However, some run-ins with the cricket authorities put paid to that. For the record, Shastri did captain India in a single Test match. The Chennai Test against the West Indies in 1988, which India won thanks to an explosive debut by Narendra Hirwani who took 8 wickets in each innings with his leg-spin bowling. So when Ravi Shastri made that revelation about Sidhu being an entertainer — that remained stuck in my mind for a long time. And now it all came back to fall in place in August 2001. Buoyed by the success of his Sidhuisms, Sidhu went on to making a full-blown career in entertainment and politics. I hear he’s recently also launched his official website http://www.sherryontop.com. I had written the draft of this post a few months back but was not getting a relevant enough context to push the publish button. But it wasn’t long before the subject of this post handed me the context on a platter. Unarguably, the greatest test opener ever! His record against the West Indies is nothing but out and out heroic. Legendary stuff. Every bit deserving of the Caribbean calypso songs written for him. And as an Indian my chest fills with pride seeing some of his innings against the fast and furious foursome — Malcolm Marshall, Michael Holding, Andy Roberts and Joel Garner. The hooked six of Marshall at the Feroz Shah Kotla, Delhi after the paceman had creamed us at Green Park, Kanpur in an earlier match gave me goosebumps. Those are incidents that have defined my unstinted admiration for this batsman. And then came the dropping of Kapil Dev from a test match against the visiting English team in 1984. This was a punishment for playing reckless cricket. The same reckless cricket that he played when he hit Eddie Hemmings for 4 sixes, when India were nine wickets down and needed 24 runs to avoid follow-on. The same reckless cricket he played when he hit that unbelievable 175 against Zimbabwe. The Calcuttans hated Gavaskar for Kapil Dev being dropped for quite some time. My memory is a little fuzzy here — but Gavaskar vowed never to play at Eden Gardens again after being booed by the crowds. But soon, Gavaskar relinquished captaincy after winning the Benson & Hedges World Series Cricket championship in Australia. And a few years later he stuck to his decision to retire from cricket even when the fairytale farewell didn’t happen — India, one of the favourites — crashed out in the semi-finals of the Reliance World Cup. This was clearly the sign of a man of dignity and someone who chose to walk out rather being eased out. Around that time, he also appeared in Sunil Gavaskar Presents — an outstanding programme, where Sunil Gavaskar — the batting legend and one of the sharper brains in world cricket — picked out and analyzed for us, some of the best cricketing performances in world cricket. He also authored three books, Sunny Days, Idols, and One-day Wonders, the first two doing reasonably well. Everything till here is fine. And then something went bizarrely wrong. Sunil Gavaskar who had a newspaper column and ran a syndication service till then, became a television commentator. Sunil Gavaskar, the commentator — notwithstanding the fact that he truly was a great cricketer — is incredulously and unfailingly petty! He started as a very bad commentator. Hmmm-ing his way throughout. His English at best grammatically correct. Neither entertaining like Henry Blofeld’s; nor with a sense of drama like Tony Greig’s; nor is it brutally honest like Geoff Boycott’s. So much so, it is not even blatantly one-sided like Imran Khan’s (except when talking about Tendulkar during Tendukar’s not-the-best years). Now before you pounce on me with ‘why should it be any of these?’ — I am saying all this because it in any case is not what it could have been — worthy of such a genius of an opening batsman! Perhaps the only time he got it right was when he backed Pakistan during the 1992 World Cup, when Pakistan got off to a bad start. Then one witnessed his anti-English statements which were clearly playing to the galleries. What I call juvenile jingoism — which he toggles with faux urbane statesmanship. In simple English? He’s a hypocrite. (BTW, this is EXACTLY what Ricky Ponting said recently when out of the blue, Gavaskar commented on the Aussies being ‘unpopular champions’). Not may people may recall this now, but Gavaskar had advised Tendulkar not to appear as a batting role model for an MCC coaching manual. Geoffery Boycott eventually appeared for that. Incidentally, he was also the most vocal and ostensible backer of Tendulkar even in the days when Tendulkar was doing hopelessly as a captain! Of course there are very few people in India who have the courage to call a spade a spade in the context of Tendulkar — unlike a Boycott for example. But Sunil Gavaskar is the number one person I would expect to say something like — “Tendulkar is so passionate about his game that he contributes to the team’s cause in every way” when Tendulkar throws from the outfield into the wicket-keeper’s gloves on a day when Tendulkar gets out for zero! Perhaps what substantially influenced my current opinion of Gavaskar — the commentator & writer — was his response (or lack of it) to the death of Raman Lamba. Lamba was one of the superstars of the Delhi and North Zone teams, and had successfully made it to the Indian team by the dint of tons and tons of runs (literally) he scored in the domestic tournaments. And it was he who should actually be credited for India’s first six over third man and not Virendra Sehwag! Raman Lamba after his retirement from international and domestic cricket, was helping Bangaladesh as a cricket mentor. He was fielding at a close-in position when he was hit on the forehead by a full-blooded shot. He immeditely went into coma and died a few days later. As tragic an end as possible! Sunil Gavaskar, never wrote a word of condolence about this. And I believed this was yet another instance of his pettiness against the backdrop of a traditional rivalry between North Zone (Delhi/Haryana/Punjab) — vs West Zone (Mumbai/Baroda/Maharashtra) players. And then some days later the headline for Gavaskar’s weekly column said, “A true lover of the game”, and I said to myself, I was wrong. Gavaskar indeed was an honorable man! BUT, the article was about Raj Singh Dungarpur’s return to an active role in the cricket administration of India. (Read as politics of BCCI!) It was Raj Singh Dungarpur who was “A true lover of the game”. Perhaps as a reward for his feting of such “true lovers of the game” — Gavaskar has been in some key administrative positions as well. E.g. on the ICC panel of umpires. Or as the stand-in coach of the Indian cricket team when Ajit Wadekar had a heart attack mid-series. How much of a difference did he make in those roles isn’t anything worth writing about! Oh yeah, let us not forget how his son Rohan Gavaskar, was selected for the Indian team when he (Rohan) was actually past his prime! A few more examples of his petty-mindedness were his reference to the death of David Hookes (which he subsequently apologized for, apparently); or of trying to defend Sreesanth’s provocative gesture upon taking a South African wicket, “he is just saying a namaste, which is a form of greeting in India!” Huh? Ironically, Rohan Gavaskar, who was one of the guests on TV show on cricket a few days back, was so much better and perceptibly more honest than his father! I realize, this is turning out into an endless rant, so let me wind off with this bit of partially related trivia. Ravi Shastri was once asked to comment on the commercial endorsements by cricketers — and he said something to this effect: ‘If we (Kapil Dev and Shastri) are accused of being the leading cricketers in terms of commercial deals, then Sunil Gavaskar is ‘hum sabka baap’. Ok these are not predictions in the ‘astrological’ sense of the word. These are statements (or my memory of them) made by cricket commentators/writers in the last few years. Disclaimer: These are not ad-verbatim. This is one of those rare occassions when Sunil Gavaskar stuck his neck out, and got it right when he backed Pakistan during the 1992 World Cup, even though Pakistan got off to a bad start. Sardesai said that ‘…Laxman (is) as good as the big-three…‘! The big three being — Sachin Tendulkar, Saurab Ganguly and Rahul Dravid. This was the series where Laxman regained some pride for India with a masterful 167 in the last test at Sydney, which India lost (India lost the series too 0-3). Soon after that series Laxman made it the big-four! ‘…The player to watch from India is Saurav Ganguly…‘ This when we in India expected Sachin Tendulkar to be one and only name that should’ve cropped up for this. And Ganguly was the second highest run getter for India in the tournament — and hit that 183 in a (then) record-breaking partnership with Rahul Dravid against Sri Lanka at Taunton! This Sunday morning my wife and I drove into Woodlands restaurant on Chennai’s Cathedral Road. Not the Woodlands by the side of Hotel Savera, but Woodlands — the drive-in restaurant. Incidentally Woodlands seems to be a very popular name for restaurants in Chennai! There is Chhote Miyan in Mumbai which is a busy parking lot by the day and a busier outdoor eatery by the night. But I don’t recall too many people sitting in their cars to eat. There are tandoori stalls all over Delhi, where you would find people parked by the side of a a busy road to blare out loud music with their windows rolled down and eating some chicken on the side. Of course there is Pandara Road, where the parking lots are used as eateries. Then there is the famous chaat stall on Shahajahan Road, where people prefer to sit in their cars ony to escape being trampled by the mob that gathers around the serving counters! Of course there are the McDonalds drive-through outlets, which technically speaking, are the thematic opposites of ‘drive-ins’. So, this Sunday morning, when we drove in, we saw a familiar face — that of Vijay Amritraj (of course there was the rest of him too!). Once upon a time, Vijay Amritraj was the most looked-upto sportsman in India; of course after Kapil Dev and Sunil Gavaskar! It was indeed a delight to park our car close to him. However, we soon caught ourselves (and many others) gawking at Vijay’s entourage, which included his brother Ashok Amritraj. It was rude. So the conscientious me decided not to stare. Instead I turned my rear-view mirror at an angle, where I could see them without having to ostensibly turn my neck! Vijay left in his Mercedes, while Ashok left in his Hyundai Sonnata. Ok, that’s an assumption of ownership, but had me wondering — who is the richer of the two brothers? Of course Ashok struck it rich much later in life, when he and Jean Claude van Demme scripted a few successes in Hollywood. I heard him narrate his struggle story in 2004 at Frames, the annual media event organized by FICCI (read here). In case you are still reading, we had our regular order of masala dosa followed by filter coffee! Many of us saw it live. Many of us saw it in the next day’s news. It has been the subject of many coffee-table discussions and a few national debates as well. All kinds of ‘lip-reading experts’ are now being called in to ‘speculate’ on what Materazzi could have said to provoke Zidane. The topic has also found its way into debates on masculinity, honour, religion, race, relationships, and many others. Now that the shock and disappointment is settling down, how about seeing something that didn’t happen? This site has around 10 pages of some imaginatively created animated renditions where the action has been juxtaposed in different contexts (caution: some of the humour is gory).